Free shipping in Berkshire county and some surrounding areas, including New Lebanon NY, Canaan NY and Stephentown NY. Please call the office to see if your job site is included in our delivery area. Boom truck delivery is available. Please let your salesman know if your delivery will need to be boomed. We will do our best to put your order as close to the project as possible. Want to know if your order has been delivered to the exact location you requested? Call us at 413.442.6916, and we will confirm your order's status, and where and when it was delivered. We have free, prompt delivery throughout our service area. Our commitment to service and quality extends to getting your materials to the job site quickly and accurately. 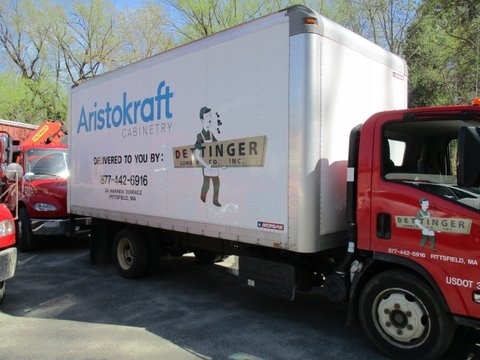 Our delivery fleet includes a box truck, a flat bed and two trucks equipped with cranes. This enables us to efficiently and safely deliver whatever material you need and have it placed where you want it. We make virtually all of our deliveries within 24 hours and many within the same day. For more information on our construction delivery services, contact us or call us today at 413.442.6916.